The work we do in Counties Manukau is critical for the wellbeing of the whole community. We are grateful to receive approximately 2/3 of our income from government contracts. Unfortunately, we still remain substantially underfunded. Any donation, large or small will be gratefully accepted. Did you know that you can claim a tax credit for donations over $5.00 made to us? You may be able to claim a 1/3 of your donation back in your annual tax credit claim. Please include your contact details including full name, address and contact day time number and mobile number and email address so we can send you a receipt for tax purposes. You can make a debit card or credit card donation via Givealittle owned by the Spark Foundation. Unlike other fundraising websites, Givealittle do not take a percentage of the donation. You will receive a tax receipt automatically. Please make a reference in the available fields of your name and contact daytime phone number and reason for donation i.e general donation, annual appeal etc. 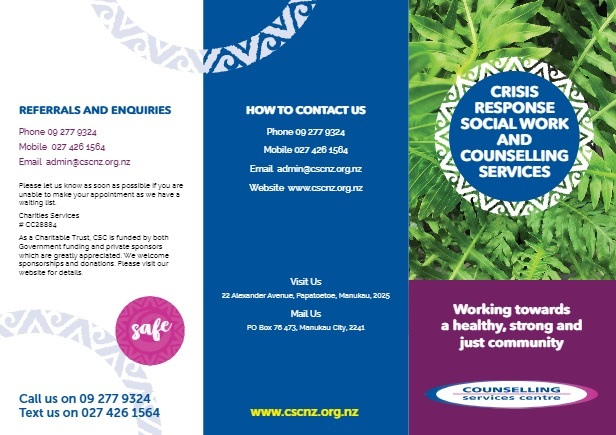 Please then contact our office admin@cscnz.org.nz to provide your details so that we can send you a receipt. Recently legislation has changed to enable donors (you the person donating) to receive a tax rebate on your donation to approved donee organisations (charities receiving the donation). This means that when you make your regular donation each pay period to Counselling Services Centre, you do not have to wait until the end of the tax year (31 March) to get your tax rebate. For every dollar you donate you will get back 33.33 cents that pay week. Payroll Giving allows employees to receive immediate tax benefits from their donations each payday. For example, a $30 monthly donation to your favourite charity only takes about $20 out of your pay packet. A bequest is a special way to remember your family or friends or a charity in your Will. After you have acknowledged those close to you, please consider remembering Counselling Services Centre in your Will. Your legacy will ensure that our organisation can continue to make a real difference in the lives of our clients into the future. We strongly recommend that your Will is drawn up by your legal advisor so that your wishes are carried out exactly as you intended. Following is the suggested wording that can be included in your Will. Again, please consult your Solicitor or legal advisor so that your wishes are recorded legally. This is a very special way in which to remember your loved one. You may wish to invite friends and family to honour your loved ones memory by making a donation to Counselling Services Centre in lieu of flowers. The Funeral Director can organise to send through the donations to us via our postal address. Receipts along with a letter of thanks will be sent to donors who provide their name and address details. A list of names and addresses and a total amount (not the individual donation amounts) is sent to the family when all donations have come in so the family can send their own thanks. You may wish to invite family and friends to make a donation to Counselling Services Centres in lieu of engagement/wedding/birthday gift. For engaged couples who feel they have everything they need, this is a lovely way in which to celebrate their special day and show they care about people who are facing a tough time emotionally. At Counselling Services Centre we appreciate every gift to us no matter the amount. Major Gifts however enable us to fund larger or ongoing projects with more certainty. Corporate social responsibility is sometimes referred to as “corporate citizenship”. It is a mutually beneficial way for both the charity and the corporate to celebrate their partnership. It also promotes positive social and environmental change. Whether it be through donations-in –kind or cash sponsorship, we would really love to hear from you. Please consider joining our family of corporate sponsors. The benefits to your company are not only financial, the support you give contributes to staff morale and identifies your company and brand as a business that cares about it’s community having many positive spin-offs. We welcome help from volunteers to assist with a number of tasks at our Centre, i.e. data entry, stuffing envelopes, fundraising events etc.